Kindergartner Sarah Bailey (left) and her Reading Buddy, third-grader Isabella Costanza. Isabella Costanza’s newest pal at Park Avenue Elementary School is also among the youngest, a kindergartner named Sarah. The two are Reading Buddies, paired up once a week or so to read together and work on projects. As a third-grader, Isabella is several years older than little Sarah Bailey, but being a young mentor to a kindergartner is, she says, one of the best part of her days. At Park Avenue, Reading Buddies matches a third-grader with a kindergarten student. Isabella is a standout because of her dedication, patience, and enthusiasm. “She’s a terrific Reading Buddy ambassador,” said Park Avenue Principal Sandra Wood. Typically the Grade 3 class will visit its partner kindergarten class for planned activities, which may include reading together, playing an educational game, or working on an assignment. The classroom teachers matchup the Reading Buddies, taking their personality, work style, and interests into account. Kindergartners enjoy the one-to-one attention from a “big kid,” and the interaction enhances their vocabulary and reading skills. 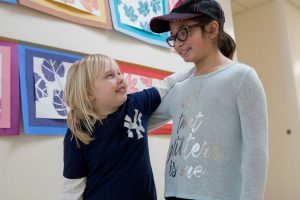 Making pals with an older student also means there’s a familiar face among the tide of older, bigger students in the hallways, which is very reassuring to the school’s littlest pupils. “I see her in the hall and we always wave to each other,” says Sarah. For the third-graders, being a Reading Buddy further develops their own literacy skills while building leadership and mentoring abilities. That, and it’s fun.